Capnography has revolutionized how paramedics diagnosis, treat and manage patients. If your organization has not already implemented capnography here is a 10-step process to successfully implement capnography. As with any new product and clinical care implementation there are countless responsibilities, questions, and tasks that need to be addressed. Having one individual lead the process with help you achieve a seamless and successful implementation. A project manager should have some previous knowledge or experience with capnography. If they don’t, give them some time to get up to speed, using CapnoAcademy.com articles and resources, before moving to the next step. Medical Director or representative: It is more than likely the medical director has already signed off on bringing capnography into the system. Nonetheless, it would be good to have their continued input through implementation. Emergency Medical Responder agency representative: This is a stakeholder we often leave off the table. As we begin a new patient care skill, process, or procedure first responder agencies will be involved in that change as well. Having them at the table and asking for their feedback will go a long way in the success of the implementation. Remember, capnography monitoring is within the capabilities of BLS providers and if the budget allows include BLS provider education on capnography. Field personnel representative: Another group we often overlook when implementing new equipment is our field personnel. Regardless if it is a new process, procedure, policy or piece of equipment, you should always have representation from the workforce. They are the end user of our leadership decisions, and should have a say in implementation from the very beginning. Another win from engaging field personnel early is that you are cultivating a cohort of employee champions to assist with developing buy-in and leading implementation. What kind of capnography do you need to purchase? Will capnography be added to new or existing cardiac monitors or is this a stand-alone device purchase? What is the cost of ownership, including routine maintenance, calibration, and replacement of disposables? What is the cost of initial training? What is the projected cost of ongoing or continuing education? What is the cost of additional quality assurance efforts for capnography use? Are you able to bill for capnography monitoring and supplies? Once your team has answered these questions, you will have a better understanding of how best to move forward. There are many EMS systems already using capnography. Reach out to your peers for purchasing recommendations, as well as documentation you may be able to reuse or adapt for your system. Pre-work by field personnel before implementation: Assign CapnoAcademy.com articles to personnel to read before implementation or classroom training. Ask members of the implementation team to find and share articles with the workforce. Develop super users: Before the vendor leaves choose the capnography subject matter experts in your system. Identify these super users as soon as possible and prepare them to be as knowledgeable as possible so they can assist others. Nothing will frustrate the workforce more than not having answers to their questions from easily accessible, in-house experts. Implement the training program you have planned. A hybrid program that includes self-study and group hands-on practice and competency checks is a best practice. If possible include a field-training component to make sure classroom training is carried over to practical use in the field. Since you are likely to offer the training program multiple times to reach all personnel use feedback from your workforce to adapt and improve the training program as it is delivered. Our goal is to improve patient care and the best way to do that is to ensure field personnel know when and how to use capnography. Once the capnography training is completed and the workforce is ready to use the new equipment, there should be an official training document of competency that is signed off by the trainer and the field provider. It is important to have an official record that training was completed. For many types of patients Capnography is considered the standard of care. Now that capnography is in your system, it has to be utilized regularly and consistently. Adapt your existing CQI process to identify capnography use, any challenges with implementation, and if any additional training is needed for individuals or across the workforce. Furthermore, you can now determine how patient care is impacted or improved with capnography. Remember, once the devices hit the streets the implementation of capnography has ended, but the oversight has just begun. Feedback is one of the most important components for success of any new process or initiative. Set-up a mechanism to share as much data with the workforce as possible about capnography utilization and improvement. Post aggregated patient care data in common areas that the workforce can see and discuss. Provide individual feedback at regular intervals over the next 90-120 days to hardwire use of capnography into individual practice and organization culture. Remember, feedback is a vital way to ensure continued compliance with a clinical practice, allow for continuing education, and show how implementation has improved patient care. 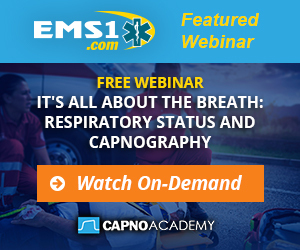 Have you successfully implemented capnography in your system? What did you learn along the way? Share your experiences and lessons learned in the comments. Chris Cebollero is a nationally recognized Emergency Medical Services leader, author, and advocate. Chris is a member of the John Maxwell Team and available for speaking, coaching and mentoring. Currently Chris is the Senior Partner for Cebollero & Associates, a medical consulting firm, assisting organizations in meet the challenges of tomorrow.